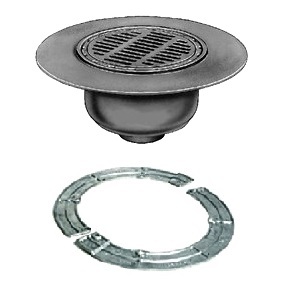 PRODUCT: Smith DX2566-C, 12-1/4 inch OD Grate, High-Capacity Deck Drain Kit. Includes Underdeck Clamp, 20 inch OD Duco Finished Cast Iron Wide Flange Body, Sediment Bucket. Price/Each. APPLICATIONS: Used to provide high capacity drainage on promenade roof decks and balconies where a waterproof traffic bearing covering is to be applied. Included sediment bucket prevents debris from entering the drainage system. Commonly used in areas where waste water contains solids or debris that must be prevented from entering drainage system. Wide flange allows adhesion of waterproof traffic deck covering, insuring watertight integrity. "Safe-Set" designs insures bucket replacement after cleaning. Free Area: 25.25 Sq. In. For waterproofing thicknesses up to 3/16" thick. UNDERDECK CLAMP should be used on ALL installations (except poured-in-place). Roof drains must be firmly secured to the roof with an underdeck clamp, otherwise, due to snow loads, rain loads and regular expansion and contraction, the drain will work in and out of the roofing, causing roofing membranes to flex and fail. Brittle tar will crack and leaks will occur.